The first web comic strips reflected the office cubicles and Quake deathmatches of the late 90’s. These comic strips moved gaming culture from society’s fringe into the mainstream, and made it cool to be a nerd. Thank you to Scott Adams (Dilbert), J.D. Frazer (User Friendly), Scott Kurtz (PvP), Jerry Holkins and Mike Krahulik (Penny Arcade) for keeping up extensive, amazing, FREE, online archives of their comics. 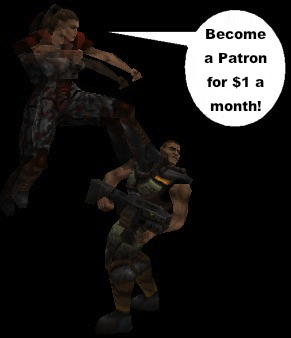 For way more Quake comics please check out http://dondeq2.com.